As you’ve probably heard, the first A350 flight from the US got off to an interesting start last week. TPG Editor-in-Chief Zach Honig was one of 36 passengers on board, and he’s here to run down his list of why this flight was his most memorable to date. I’ll come right out with it: Qatar’s inaugural A350 flight from the US definitely didn’t go as planned. While an aborted takeoff isn’t terribly unusual, the circumstances of this particular flight made the blunder especially notable — so much so, in fact, that news outlets around the world covered the flight, including Mashable, Huffington Post, CNBC, Daily Mail, Popular Mechanics and even CNET. Some publications really got carried away with their headlines, and I want to clarify again that we were not in any serious danger, and while we could have benefited from some more information from the cockpit, the crew performed their duties admirably. Yes, this has been covered extensively, and ultimately it wasn’t that big of a deal. Still, there’s no getting around it — the most memorable component of this flight was definitely the aborted takeoff. Some of the coverage described the abort as terrifying, and that’s clearly a stretch. The other passengers and I were definitely caught off guard, and even a bit shook up. Hearing that the plane determined that the runway was too short wasn’t reassuring, especially considering that Qatar’s CEO was very cavalier regarding the airline’s recent takeoff incident in Miami, saying “such kinds of incidents happen quite often” just one day before. Oddly, the pilots weren’t able to correct the error — we had to take off from an entirely different runway instead. The lobster was OUT OF THIS WORLD. Before you get too excited here, it seems that Qatar catered the inaugural flight quite a bit differently than it would for regular service. 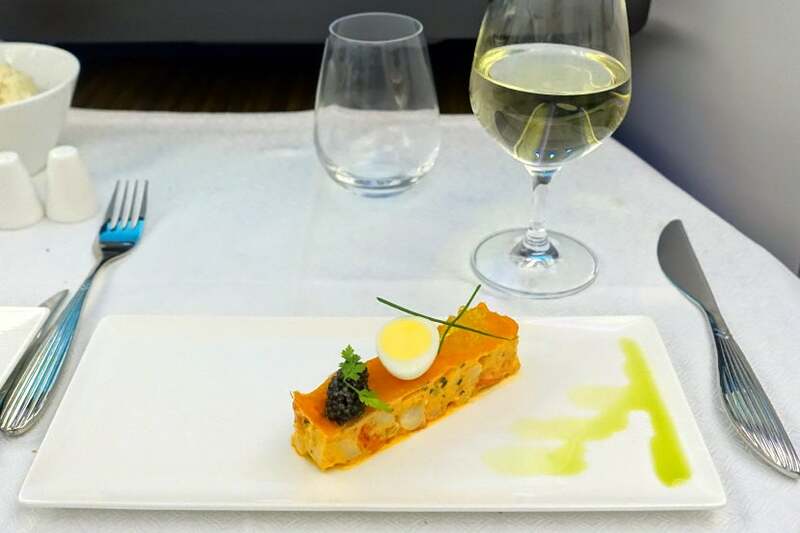 In fact, I flew the A350 to Munich from the airline’s Doha hub a few hours later and I was fairly underwhelmed by the food I had there. On this flight, though, most of the dishes I had were fantastic. In fact, one of the appetizers I had was hands down the single best item I’ve ever eaten on a plane. The North Atlantic lobster was phenomenal — it was topped with thinly cut smoked salmon, oscetra caviar, a quail egg and tiny pearls of olive oil that resembled salmon eggs. It tasted even better than it looked. When I told the flight attendant clearing my plate how much I enjoyed it, she insisted on bringing me a second! I even asked for a third as part of my breakfast, but unfortunately they ran out by that point. 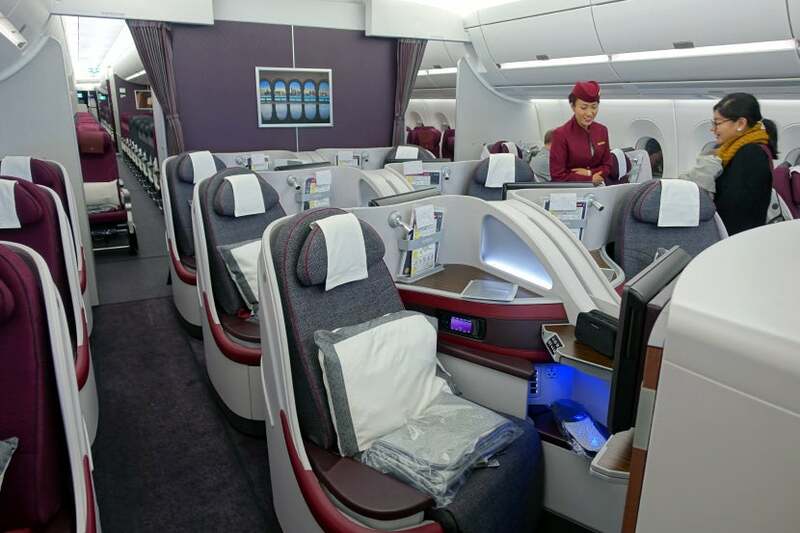 Qatar’s A350 business-class cabin has 36 seats. Qatar’s A350 business-class cabin is hardly the most private in the industry, but I’d argue that it’s the most comfortable. The seats are roomy — the 1-2-1 configuration allows plenty of personal space. There’s also more vertical space than you’d usually expect to find on a commercial jet, since Qatar opted to exclude overhead bins in the center section of the cabin, bringing higher ceilings to business class. The seats are very well designed, with intuitive controls, plenty of connectivity and a great entertainment system. Everything worked perfectly on the inaugural, but I was a bit surprised to find that the three sets of noise-canceling headphones I tried on my connecting flight all had buzzing issues. Of course, even completely free of flaws, Qatar business doesn’t hold a candle to some first-class products, such as Etihad’s A380 Apartment. But it’s excellent for business class. 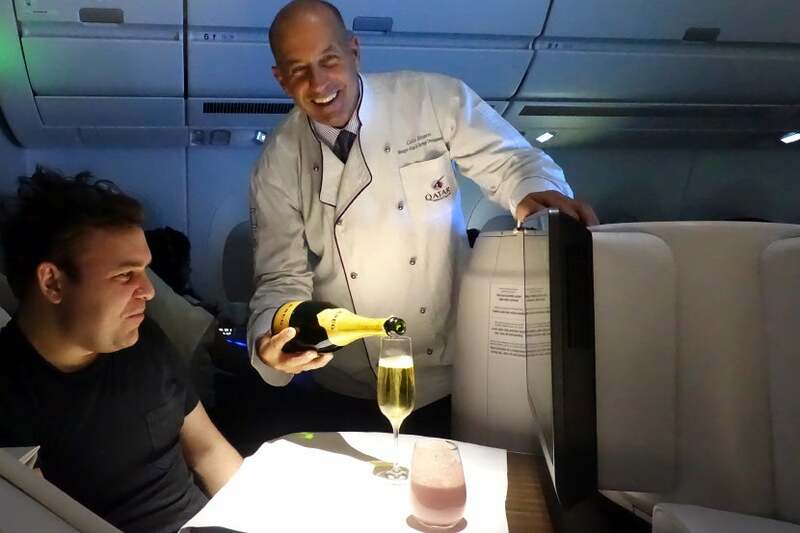 Qatar’s F&B manager serving Krug to another passenger on the flight. Qatar’s food and beverage manager was on the flight, along with a few bottles of Krug Champagne that were left over from cabin tours earlier in the day. Most of the airline’s executives kept to themselves during our 12-hour journey, but some were up and about, chatting about their love of the industry and Qatar’s brand new plane. The flight attendants were fantastic as well — one mentioned that she suspected that the crew had been handpicked by Qatar’s CEO, and they all represented the airline very well. By comparison, the crew on my connecting flight to Munich was fine, but not nearly as enthusiastic. Qatar’s A350 has 247 seats between its two economy cabins — and not a single one was occupied on this flight. You might consider that a bit wasteful on a 12-hour long-haul like this, but Qatar clearly wanted each of the 36 guests on board to have the best experience possible, which meant leaving coach completely empty. I decided to “downgrade” myself temporarily for a few minutes and found the seats relatively comfortable (for coach), with plenty of legroom. I may have felt differently sitting shoulder-to-shoulder with 246 other crabby coach flyers, though. As Qatar Airways doesn’t yet offer scheduled A350 service from the US, it wasn’t possible to pay cash or redeem miles for a ticket on this charter flight. However, as TPG policy is to not accept free travel, we will be “purchasing” the flight in the form of a reader giveaway. Later today, we’ll be running a giveaway for 67,500 AAdvantage miles, which matches the award redemption rate for JFK to Doha. The winner will be able to use these miles to book a business-class Qatar flight of their own, or for any other redemption they wish. What’s the most memorable flight you’ve ever had?